About a year and a half ago my wife and I enrolled in Dave Ramsey‘s financial basics class called “Financial Peace University“. The class aims to help people take responsibility for their financial lives, dump all of their debt, and plan ahead for their future. The class is actually quite fun because of Ramsey's engaging speaking style, and sense of humor, so if you have considered taking the class, I would highly recommend it. If you want a preview of some of his teachings, check out our series on Dave Ramsey's 7 Baby Steps plan for getting out of debt. In the 13 week class we learned a lot of great ways to cut back on your spending, and how to get out control spending categories back under control. Among those tools were doing a family budget, and having regular budget meetings, in addition to using the Cash Envelope system for budgeting. Today I thought I'd look at how to cut your spending by using a cash envelope. Before you even go down the road of setting up your cash envelopes, you need to set up a family budget. If you don't know what money is coming in, and how much should be going out to regular monthly expenses, it will be hard to actually implement your cash envelopes. So the first thing you have to do is figure out how much money is coming into your accounts as regular monthly income. This is the money you have to work with. 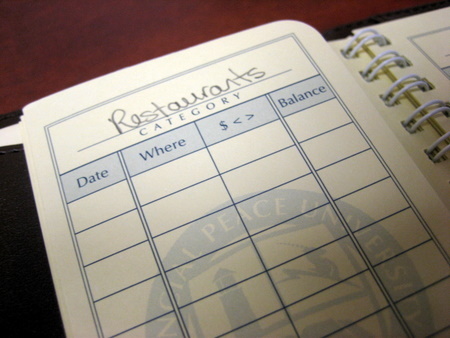 Next, you need to track your expenses so that you know how much money is going out, and to what expense categories. You'll have regular monthly expenses like your mortgage, utilities, taxes and student loan payments that are going to be pretty much the same every month. Then you'll have variable expenses, the expense categories that will be different from month to month. Things that could be included here include things like groceries, dining out expenses, entertainment spending and a variety of other things. At our house tracking our expenses was pretty easy as we had already been tracking pretty much every dollar coming in and going out via money management softare – Microsoft Money. Because of that we had several years of spending history at our disposal. We were able to take a quick look at our monthly spending, and figure out what we were spending, and what areas were possibly over-represented in our budget (like our dining out spending). Once you’ve figured out what you need to spend every month on the basics, the next step is to set up a monthly cash flow plan, and make sure that every dollar is assigned a job through doing a zero based budget. What's a zero based budget? A zero based budget means that once you tally up all income, expense, giving and saving categories, you'll end up with a balance of zero. Every single dollar of income that comes into your accounts will be allocated, and assigned a job. If you make $5000 of net income, all $5000 of that should be allocated either to an expense or savings category. That way you won’t have the extra money (after expenses) disappearing into the ether. It gets saved, or assigned to a debt, or gets some other job. Your money works for you instead of just disappearing into nothingness. Figure out your income. For most people this will be the same every month. Figure out your set expenses. These should be pretty close to the same every month. Figure out other variable expenses (like food, shopping, entertainment) and assign a realistic dollar amount for that category in the budget. Put together a zero-based budget where every dollar of income and expense is allocated, and you end up with a zero balance. Now that you've setup a budget, and you know how much you need or want to spend on each category, you're ready to set up your envelope system for budgeting. The first thing you need to setup your cash envelope system is… you guessed it – envelopes! You can just use regular plain white envelopes if you want, or go with something a bit more advanced, like our Dave Ramsey cash envelopes. In any event, the idea is to get something where you can write on the envelope, and keep track of spending, and how much is in your envelope. Once you have your envelopes you need to figure out what categories you'll be using the envelopes for. I would suggest using them for most/all of your variable spending categories that you have in your budget. Things like dining out and entertainment, household expenses and personal spending money. Anything that could change from month to month. For us we leave out categories that rarely change, and just pay those regularly every month out of our accounts. The idea behind the envelopes is that it helps you control your spending on certain problem categories by giving you a set amount of money each month in your envelope that you need to use towards that category. When the money is gone from the envelope, you don’t spend any more money on that category. Period. If you absolutely need to spend more, you have to take money from another category to fill in the gaps. At our house we started using the cash envelopes because we had a couple of big problem categories that we consistently overspend in. Eating out/restaurant spending and shopping spending. My wife and I love eating out, and in some ways eating out is our way of connecting with each other, spending time together and relaxing. If we have a date night we go out to a nice restaurant and enjoy an evening together. While there isn't anything necessarily wrong with that, our problem was that we were doing it far too often, spending hundreds of dollars a month on dining out. So to fix this problem we added a “restaurant” budget category to our envelope system. In the picture below you can see our envelope for “Restaurants”. We also set up envelopes for other problem categories where we were prone to overspending including groceries, shopping, entertainment and “blow money” (blow money is personal money we can spend for any reason we want, without asking the other person). So now, when we get paid every month, we withdraw a budgeted amount of cash for all our problem categories, and put them in our envelopes. So as an example, let's say we budget $150 for eating out in a given month. When our first of two paychecks comes in for the month we'll go to the bank and withdraw $150 for our “restaurants” envelope. Now when we go out to eat we can only spend what's in the envelope. So if we eat out one more time than we had anticipated, and we come up $20 short from our restaurants envelope, we'll need to take that $20 we're short from another spending category or envelope. Barring that we would just have to forgo eating out that last time that month. If you don't spend all of you budgeted money in your cash envelope you can just have it transfer over to the next spending period, or at the end of the month allocate it to a debt or saving category – which is what we prefer to do. I know a lot of people aren't real comfortable using the cash envelope system at first, especially if you have a large number of problem categories – and envelopes. You can feel a bit silly pulling out your big cash envelope wallet, or stack of envelopes everywhere you go. We know one couple who goes a bit overboard with their cash envelopes, and they basically have an envelope for every conceivable category. While it works for them, and they end up saving a lot of money, for us it would just burn us out to have so much detail. For us, we just have about 6 main cash envelopes that we use for our biggest problem areas. So for our 6 envelopes that we were using, we would end up withdrawing about $1000 for each month and assigning it to one of our envelopes. It's a lot of cash, but part of the great part about this system is that when you're actually spending cash like that, you'd be surprised at how much it hurts to spend cash. You'll find that you'll often start playing a game with yourself to see how much money you can have left over in your envelopes at the end of the month. It actually can be fun! Set up a zero-based budget, and figure out how much you spend in all categories of your budget. Find your biggest problem spending categories, and variable expense categories, and set up an envelope for those categories. Every time you get paid withdraw money to fully fund your cash spending categories for your envelope system. Only money that is in your envelopes can be spent. If a spending envelope doesn't have any money left , you're done spending for that category for that period. If you need to spend more, take it from another envelope and category. Left over money goes towards savings or gets rolled into a debt snowball to get rid of debt. Using the cash envelope system for spending can have an amazing effect on how much money you're spending every month. We saw that first hand when we saw our restaurant spending drop from $4-500/month to closer to $150-200/month. That extra several hundred dollars we saved every month went directly to our 1 year emergency fund, which grew that much quicker! Not only are you limiting how much you spend by using the envelopes, but you're also using psychology on yourself. Studies have shown that when you use a credit card, even if you’re paying it off every month, you spend on average 12-18% more. Spending cash hurts more, andwhen you pay cash, you'll end up spending less by default. And spending less than you earn is the key to anyone's success. What do you think of the cash envelope system? 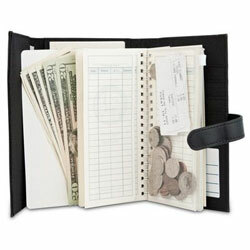 Do you currently have problem spending categories that you think could benefit from using a cash envelope? Do you think the system could be effective for you, or have you used it? Tell us your thoughts in the comments. My wife and I have been using this age-old system ever since taking FPU nearly a year ago. It saves us money every month and helps keep us on track to meet our goals. I’m pretty confident in saying that I’ll most likely be using the envelope system for the rest of my life, and I encourage you to do the same. I’ve been following the envelope system for the past four years. I can’t imagine budgeting any other way. We do so much more with them money we have. We paid of $42,000 in consumer debt and have been debt free (except for the house) since then. My wife and I have been using the envelope system for about five years and we absolutely love it. We always feel “in control” of our money and we enjoy spending the money from the envelopes (eating out for example) because we know it is part of our plan. Like Matt Jabs said, we will probably be using envelopes for the rest of our lives. I love the envelope system. I will never stop using it. A lot of it has to do with the fact that I don’t make a lot of money. I am single and frugal so I live quite comfortably, but there is not a lot of wiggle room in my budget. I also put 10% of my pay in a retirement fund and 10% in my savings/emergency fund. I keep my system very simple. Basically on payday (every other Friday) I withdraw from the bank, my allowance for the next two weeks. That night, after work, armed with a grocery list, I first put gas in the car. Since I hardly use the car, I only put $15 in the tank (plus I have an Echo hatchback which is a very fuel efficient car!). Then I buy 14 days worth of groceries (using the grocery budget which includes toiletries). Sometimes I have to go to 2 stores to hit the sales but usually from start to finish (including unloading everything and hauling it out of the car into my apartment) this takes me about 2 hours. So now, I don’t have to worry about food. It’s all taken care of and out of sight out of mind! During my 2 hours I have also bought bus tickets for commuting to work. So now, all the crisp $20 in my wallet are for what I call disposable income (DI). There is not category of DI. It’s all meant to be spent. If I need a new shirt, I buy a new shirt. If I know I am going out to dinner, I make sure I have cash for that. The nice part of the system is that you see you pile of crisp $20 and when you mentally start spending them, say on the new shirt, or the trip to the restaurant, suddenly your pile of crisp $20 is not such a big pile anymore. Suddenly you don’t really NEED a new shirt, you have a closet full of them. My biggest piece of advice for people who want to try the envelope system is NEVER BRING CASH TO WORK. You can bring your wallet for an emergency, but make sure that wallet is empty, except for maybe a credit card for an emergency. I always tell the chronically broke at work to try the system for 2 weeks to see how it works out for them. Sigh, in 10 years, not one taker. But they still complain about having no money while my bank account gets bigger and bigger. Hee hee hee! I haven’t used the system but I have been well aware of it for some time and I think it is a great way to budget and keep those variable expenses in control. Great post! Thank you for the good summary on the cash envelope system. It really works well for some people. I think the simplicity is clearly one strong point – what you see is what you get. I also think for many the idea you mentioned about it hurting to spend cash is real, that it really drives home how much money something costs. I also think cash works well for what you refer to as “blow money.” However, I think it’s also important to point out that if someone is perfectly disciplined then paying by credit card is better. * You accumulate rewards that you can spend. * You gain valuable consumer protections. * A credit card is less of a security risk than cash (i.e. if cash is lost or stolen then it’s lost forever whereas credit cards offer protections against loss and theft). Of course paying with a credit card is only better if one pays it each month in full and on time, but if that’s the case then paying by credit card offers tremendous advantages. But again, if a cash system helps someone be more disciplined and it works for them then I agree that it’s a worthwhile tool. Maintaining a diary or an expense statement is great. It helps in tracking and cutting on your extra expenses. If you really plan to save or debt free start this now you’ll be amazed to understand where is your actually money leakage. This system also reduce the frequency of ATM cash withdrawal, which save time and effort.